But he'll come to the shore to be with you ! 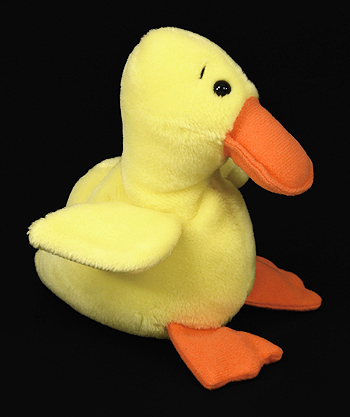 The original Quackers without wings had a tendency to lean to one side. Ty added wings to balance him out so he could stand up straight. 2. Quackers with a wing on backwards..
3. Quackers with a Bones tush tag. 4. Quackers with a Bucky tush tag. 5. Quackers with a Freckles tush tag. 6. Quackers with a Kiwi tush tag. 7. 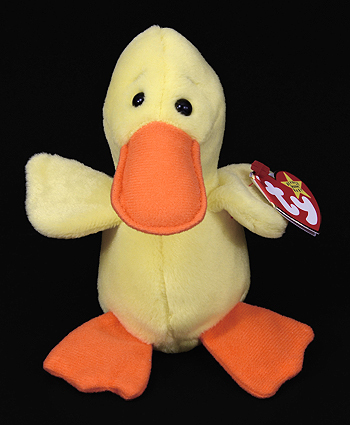 Quackers with a 1997 Teddy tush tag. 8. Quackers with a Spike tush tag. 9. Quackers with a Spunky tush tag. 1. The counterfeit version is a mint-green or bluish-green color instead of yellow.